A study in the Journal of the American Medical Association (JAMA) has found that Assisted Reproductive Technology (ART) procedures performed on women trying to conceive are relatively safe and reported complications remain low. The study was published in the Jan. 6 issue of JAMA. In the U.S. from 2000-2011, autologous (cycles using a woman’s own eggs) and donor ART procedures were associated with low reported stimulation risks, as well as low surgical complications risks -- even as more women turned to ART for reproductive help. ART includes all fertility treatments that involve handling eggs and sperm. Treatment includes the surgical removal of eggs from a woman’s ovaries, combination of the eggs with sperm, and then transfer of the resulting embryo to a woman’s body (either the patient herself or an egg donor recipient). 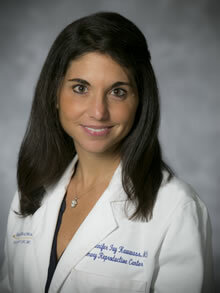 "This is the first published study using the National ART Surveillance System (NASS) to investigate complication patterns in the U.S. over a 12-year period," says Jennifer Kawwass, MD, assistant professor of gynecology and obstetrics at the Emory Reproductive Center, located at Emory University Hospital Midtown. NASS is a federally mandated reporting system that collects ART procedure information. "Increased awareness of the most common complication, OHSS, may prompt additional studies to characterize predictors of this and other adverse events in an effort to decrease their occurrences," says Kawwass. "While OHSS was the most frequently reported complication among autologous and donor cycles, it is less frequent in donor cycles. This difference between autologous and donor OHSS rates is expected because pregnancy exacerbates OHSS, and donors do not get pregnant." "We are happy to report that ART treatment is relatively safe and that reported complications remain very rare," says Kawwass. "In fact, as a women undergoes multiple cycles of ART, the frequency of complications decreases each time. This is good news for women who require several cycles to achieve pregnancy."